TS POLYCET/CEP Test 2016 Entrance Exam Notification Scheduled and Importent Dates ; TS POLYCE Test 2016 Entrance Exam Notification Scheduled and Importent Dates ; TS TSCEPCET Test 2016 Entrance Exam Notification Scheduled and Importent Dates. Telangana State Polytechnic Common Entrance Test (TSPOLYCET) for Admission into 3 years Engineering & Non-Engineering Diploma courses conducted in Government, Private Polytechnics and Polytechnics Colleges in Private Engineering Colleges of aII the Universities in Telangana State and their affiliated colieges. lt is the 2nd time to conducted this entrance exam in the newly formed Telangana State. TS POLYCET/CEP Test 2016 Entrance Exam Notification Scheduled and Importent Dates and Educational Qualification given below. TS Poly CET 2016 Entrance Notification Scheduled Released - 07/03/2016 (Monday). TS Poly CET 2016 Application with Prospect Statr from Online Applying System from - 08/03/2016. Last Date of Submission Online Applications from - 10/04/2016. Date of Conducting TS Polycet 2016 Entrance Test - 21/04/2016. Date of Entrance Test Results Announced Media - 03/05/2016. For more Information about TS Polycet 2016 visit URLs. 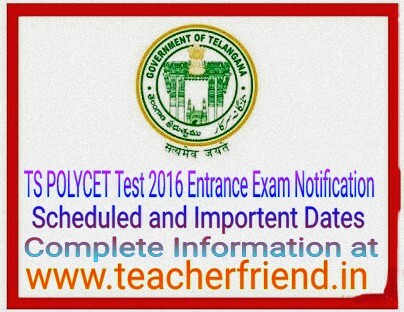 Get Download TS Polycet-2016 Entrance Notification Click Here.